Grainger Public Relations » The Scoop on Poop! 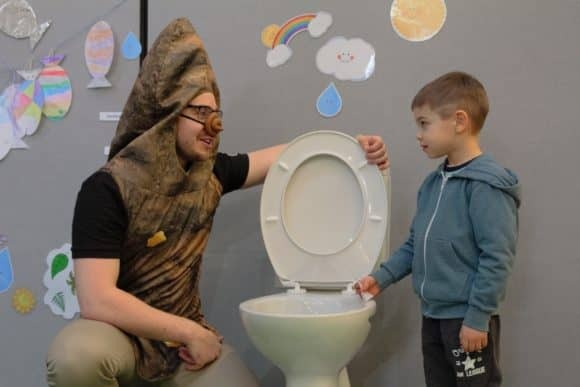 A family show aimed at lifting the lid on poo is launching at Dundee Science Centre next week, running from Wednesday 8 February through to Sunday 26 March 2017. There will also be lots of activities, including the ‘lucky dip’ where a science communicator dressed as a poo will encourage visitors to stick their hand in to a toilet, pull out a surprise poo, and ‘match the faeces with the species’, discovering the detail in different animal dung, as well as the range of human poo types, and what they say about our health. Breaking down the details of digestion, the family show will explain how our body gets the most out of our food and how to make the perfect poo. The subject will also be brought to life for younger visitors, with the eternally popular children’s book ‘The Story of The Little Mole Who Knew it Was None of His Business’ incorporated into daily Storytime Sessions for three to five year olds. The show and activities are included as part of normal admission.